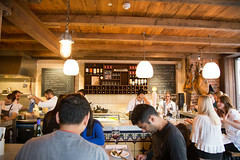 I rather enjoy tapas for both meals and snacking: there’s a certain satisfaction in having several smaller items to give you a good sampling of different flavors (and heck, it makes reviewing a bit easier since I can usually sample a much broader portion of the offerings). 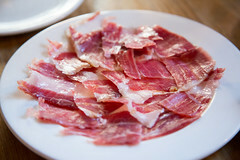 And the other thing I like is that a lot of better tapas items are surprisingly simple in execution: sliced jamon. A simple albondiga in sauce. Sliced manchego cheese. And other such simple items. Keeping that in mind, we started picking out items that we thought we’d enjoy, and ended up with a nice little selection. First up, some simple rice croquetas. Basically “risotto in deep-fried form”, these were indeed a very flavorful rice and cheese mix, delicately battered and fried to perfection. 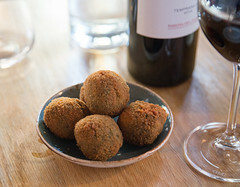 Having made these (or arancini, the Italian equivalent), these are the sort of item that separates the good and bad deep-frying cooks, since you need to balance getting the interior to a nice warm temperature throughout without over- or under-cooking the breading, and these were perfectly executed. Each litte bite was a bit of crisp breading followed by a nice bit of warm rice just oozing with melted Spanish cheese. 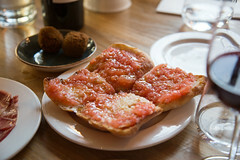 Next up: another simple dish: pan con tomate. Basically a cousin to pizza, this is a nice slab of crusty bread topped with a simple combination of grated tomato, salt, garlic, and some herbs, and again, it was quite nicely executed: each bite being a nice little bit of crust, some moist bread interior oozing with tomato, and a bit of tartness and salt from the topping. Nothing complicated, but good and satisfying food. After that, our next dish was even simpler: jamon. For those that haven’t had it, a good Iberian ham shaved into thin slices is just a masterpiece of pork expression: delicately cured bits of rich pork laced with tasty layers of fat, and here Josẽ didn’t disappoint either. Finally, I was shockingly impressed with our last dish: roasted pepper. 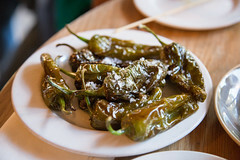 This was exactly what it said on the tin: some rich and flavorful peppers (I didn’t catch the variety, but these were similar to US-style cubanelles), roasted to a skin-crackling perfectly, with just a bit of olive oil and Maldon sea salt crystals. And I’ll have to say, this is a dish that just worked, each bite being a little bit of charred skin, some richly-flavorful pepper, a bit of olive oil, and just a bit of crunchy saltiness. I could eat these all day. 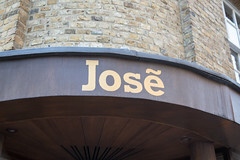 While being a bit pricey (although the Rioja was definitely part of that), Josẽ was a pleasant enough tapas place that I’m also putting them on my revisit list for my next London trip: Josè Pizarro knows how to run a good Tapas joint.